Confession: I don’t like olives. At all. Not even in a martini. I love a good olive oil, but I just can’t get excited about the pungent flavor of an actual olive. That said, this is one of the only dishes that I absolutely love, which features olives. These tasty, elegant canapés are absolutely delicious – crispy and rich with melted cheese, and the hint of curry powder gives it a subtle zing. Yeah, yeah, and the olives are good too, I guess! This is from my sweet Auntie Gladys! What could be more delicious and sophisticated than a ripe olive canapé and a glass of wine? But beware – once you taste just one of these, you will be addicted for life! Ingredient note: any small sliced bread will work – I like to use the small loaves of rye cocktail bread when I can find it. Preheat oven to 350 degrees. In a heavy saucepan over medium-low heat, combine all ingredients. 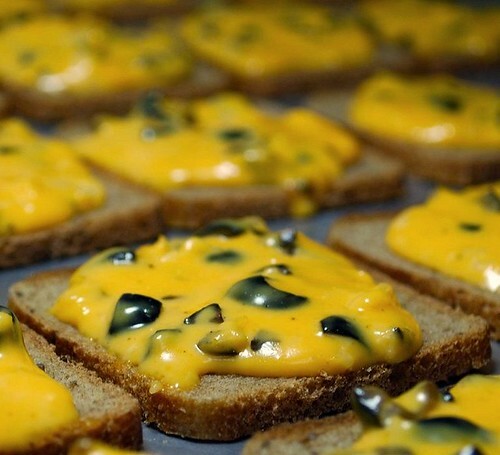 Heat until cheese is melted and all ingredients are well-incorporated. 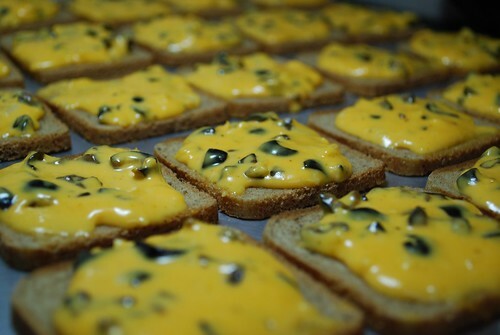 Spread cheese mixture generously on each piece of bread, and place on a baking sheet. Bake 10 minutes, or until cheese begins to puff and turn golden brown. Note: The cheese mixture can be made ahead and frozen.